One available at this price. Brand new design,brand new boat. The Express Wherry was designed (and built) by Walter Simmons as a very fast pulling boat with a wherry transom that could also be used with a double paddle when desired. She combines the advantages of both the Duck Trap Wherry and the Lapstrake Canoes and so glides almost effortlessly on the water. She is 15' overall but because her beam is only 36" she is equipped with outriggers to move the fulcrum point for her oars out to 48", just like the Duck Trap model. Her outriggers are removable. She's fast, she's light, and she's most certainly able. Her plans consist of 4 pages, from lines and offsets on through her lofted sections. We offer her lofting as well. 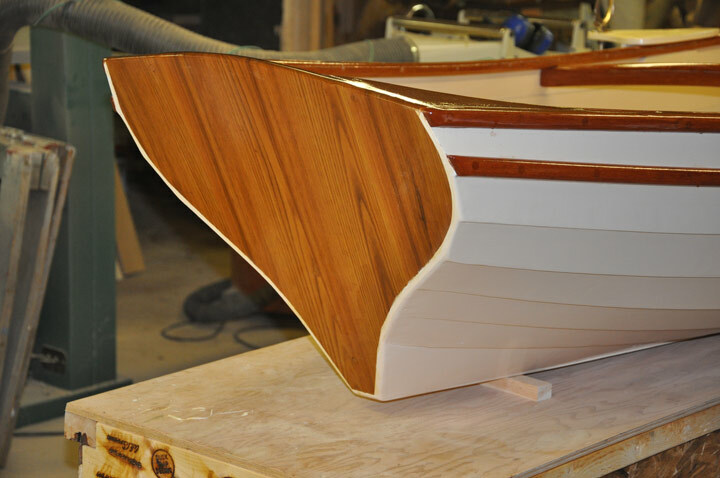 And this is her transom. Express Wherry, Canoe Wherry, call her what you will. She's one sweet pulling boat. Actually, the prototype is for sale. Click here for more photos and information.